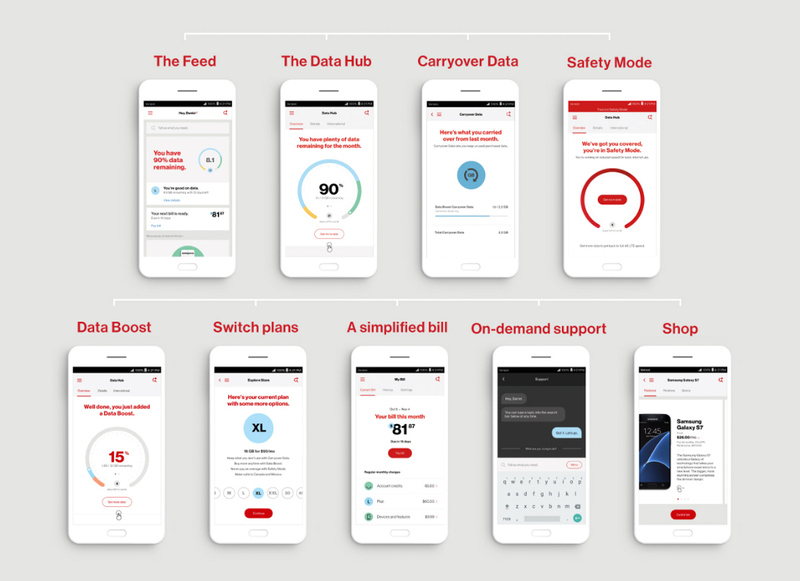 This morning, Verizon hosted an online-only press event to announce a bunch of new The Verizon Plan options, a redesigned app, and new features, like Rollover Carryover Data. We reported on all of this news through various stories over the past week, but Verizon has confirmed it all. As we exclusively reported last week, this all goes live tomorrow, July 7. The details of everything are as follows. First, Verizon is tweaking The Verizon Plan by raising prices and increasing data buckets. Funny note – during the opening of their online press event, they laughed at all of the early reports who suggested they were raising prices, as if they aren’t raising prices, except that they are raising prices. Jokes on who? The new plans provide “at least 30% more data” even if they are now more expensive. The bang-for-your-buck ratio is what Verizon is really pushing here. For example, the “S” $30-1GB plan is now $35-2GB and the “XL” $80-12GB plan is now $90-16GB. So for just $5 or $10 more, you get at least an extra GB of data, if not more. The rest of the plans are increasing as well, all of which we reported on here. You can also take a look at the new structure in the image below. If you want to jump on the new plans, you can. If you don’t want to, you don’t have to (“for now”). And in case you were wondering, all of the line access charges stay the same. What else is new? Well, you can see above. New options like Carryover Data, Safety Mode, Data Boost, unlimited calling to Mexico and Canada, and talk, text, and data in Mexico and Canada have been announced. Most are self-explanatory, but we have the basics for you below. Carryover Data: If you have unused data this month, you can carry it over to the next month for use. It only lasts for one month, though, so you can’t just save up a bunch of data and then access it in six months, for example. 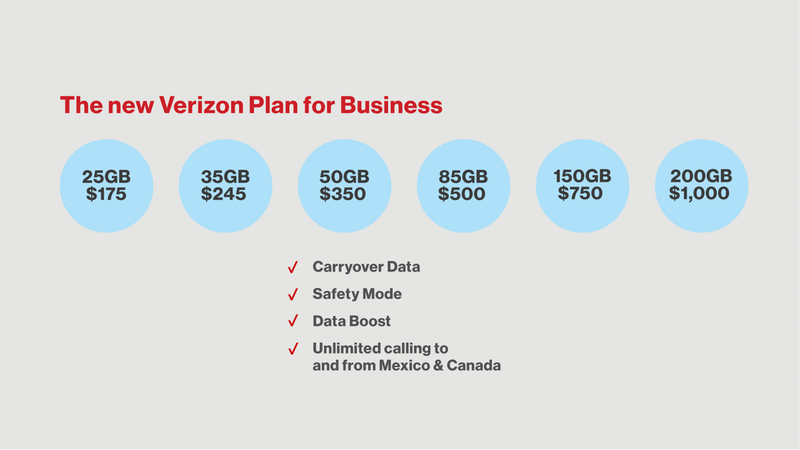 Carryover Data is a free feature added to all of the new Verizon plans. Safety Mode: This is Verizon’s take on unlimited data with throttling, like many other carriers do. With Safety Mode turned on, Verizon allows you to use more than your data bucket provides, but it throttles your speeds down to 128kbps until your next billing cycle. This new Safety Mode can be turned off or on in the new My Verizon app. If you are on a S, M, or L plan, you can add on Safety Mode for $5 extra per month. (Seriously, you have to pay $5 per month to get 128kbps, throttled data? Yikes.) If you are on the XL or XXL plans, you get it at no extra cost. NOTE: Verizon reached out to say that they are offering Safety Mode for free to the top two tiers because “those are the folks that typically go over on their data” and have to pay for overages. As you can imagine, I have about 100 thoughts in reaction to that, but will save them for another day. Data Boost: Through the new My Verizon app, Verizon is giving you a quick and easy way to add on 1GB of data to your plan should you hit your data bucket limit for the month. It costs $15 per 1GB, which is a crazy rip-off. Remember, they just bumped up their 1GB plan to 2GB for $5, yet it’ll cost you $15 for 1GB if you run out. 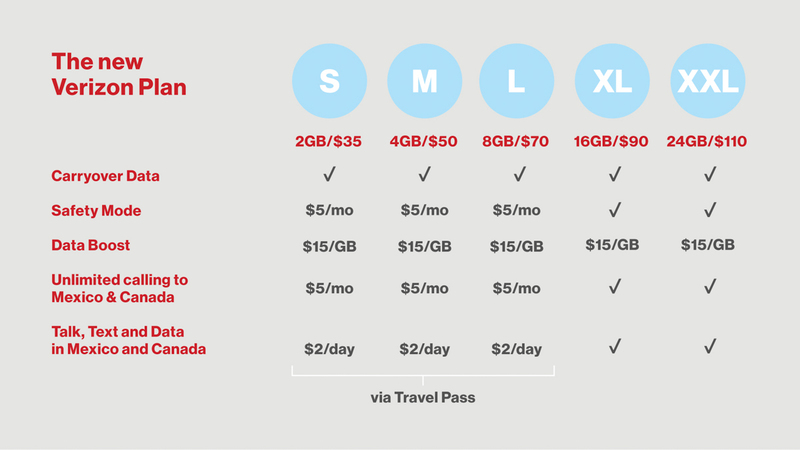 International calling and roaming for Mexico and Canada: If you are on one of the new Verizon plans, you can get unlimited calling to Mexico and Canada or use your plan’s talk, text, and data allotment while in either country. If you are on the XL or XXL plans, that all comes to you at no extra cost. If you are on S, M, or L plans, the calling to Mexico and Canada costs $5 per month and the talk, text, and data usage within those countries is $2 per day. Verizon also introduced a new My Verizon app that they seem very proud of. That’s good news, because the previous app was a bit of a mess and really just seemed like a bad web portal. The new My Verizon app can be seen below, but they designed it like a feed you would see on a social platform. They are trying to show you everything up front, like data, account, and bill in a real-time feed, along with other “personalized products and content just for you.” There is a data hub like control center to show you how much data you are using, who is using it, and how you can get more. They also added in a shop to quickly add on new services, are providing on-demand support, and can show you a simplified bill. Oh, they have new business plans as well. Those are below. Tomorrow is the day if you are interested.